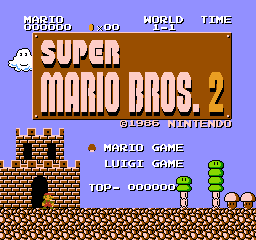 The Japanese Super Mario Bros. 2 is basically Super Mario Bros. with the difficulty cranked to 11. The expanded space provided by the disk format allowed for longer and more complex levels, several new gimmicks, and a total of 13 worlds... but overall, it's essentially the same game. Due primarily to its extreme difficulty and similarity to its predecessor, overseas players wouldn't get the chance to play the game until the release of Super Mario All-Stars, albeit in a remade form. The unlockable version included with Super Mario Bros. Deluxe did not have the unique graphics of the original release or anything normally accessible past 8-4, and non-Japanese gamers did not get to play the original unaltered game until it was released internationally on the Wii Virtual Console. Just like the previous game, RAM address 03F0 keeps track of the number of blocks hit, though no routine ever reads the value stored here. Two unused ground tiles and a cactus can be found at the very end of the SM2CHAR1 graphics file. The last tile, a more natural-looking variation of the original Super Mario Bros. ground tile, actually appears in every screenshot in the game's manual, suggesting that it was changed very late in development. Using the emulator's menu (accessible by pressing L + R) to save your high score will also save the last world you died on, meaning the A + Start combo still works even after the game is turned off, which makes it possible to complete the game in multiple sessions. It is possible to switch between Mario and Luigi mid-game without having to start over, which was not possible in the FDS version. After beating 8-4 eight times, the player must press B + Start at the title screen to access World A-1 rather than the FDS version's A + Start. These changes did not carry over to the 3DS and Wii/Wii U versions, which instead behave the same way as the original FDS version. This page was last modified on 15 August 2017, at 10:44.